Dargonomel are currently a two-piece from Russia (original members Shaks on guitars, and bass player / vocalist Var), formed in 2006 under the moniker of Subterra de Mort. 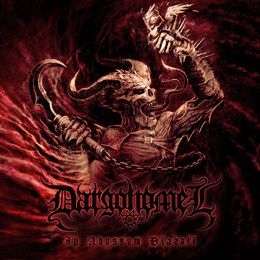 After the release of the Ultimatum-album, the band ceased its activities in 2010, but they reformed in 2011, first as Sakkath, and very soon after under the name of Dargonomel. There was a full length in 2013, called Varkulama, and now they return with In Abyssum Diaboli, which was registered at the M.House studio, with session assistance by Lux Mystherion on drums. In Abyssum Diaboli consists of nine compositions and lasts for thirty five minutes. It gets released by three highly interesting labels, Cold Raw Records, NitroAtmosfericum Records and Rebirth The Metal Productions, which I do respect a lot. The album brings fast and rhythmic, melodious and highly technical, as well as orchestral Death / Black / Blast Metal. Especially the drum patterns provide that merciless, unstoppable Über-power violence, while the vocals are guttural and growling. The guitar riffs are at the same time hi-tech executed, and melodic, with quite some remarkable structural changes and some fine leads indeed. Especially within some slower pieces, like towards the end of Cursed Blessing, the soloing riffing creates a sphere of admiration.